Donation Page / Spendeseite ermöglicht Deinen Usern eine Spende an Deinen Paypal Account zu senden. 1) lade die Datei donate.php in dein Rootverzeichnis des MyBB Forum und die Datei donationpage.php in das /inc/plugins/ Verzeichnis. 2) Installiere und Aktiviere das Plugin im Admin CP. 3) Gehe zur Konfiguration --> Spendenseite Einstellungen und ändere die Einstellungen nach Deinen Wünschen. 4) Du findest das donation_page template in den Global templates. 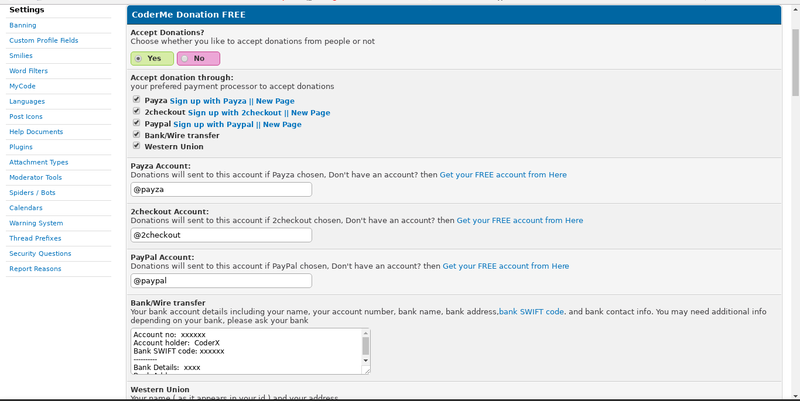 Donation Page allows you to set up a page where users can donate to you via PayPal. Configurable options include choosing whether guests can donate, setting a recommended and minimum donation amount, and modifying elements such as the page title, text, and currency. 1) Upload donate.php to your root MyBB directory and donationpage.php to your /inc/plugins/ directory. 2) Install and Activate the plugin via your Admin CP. 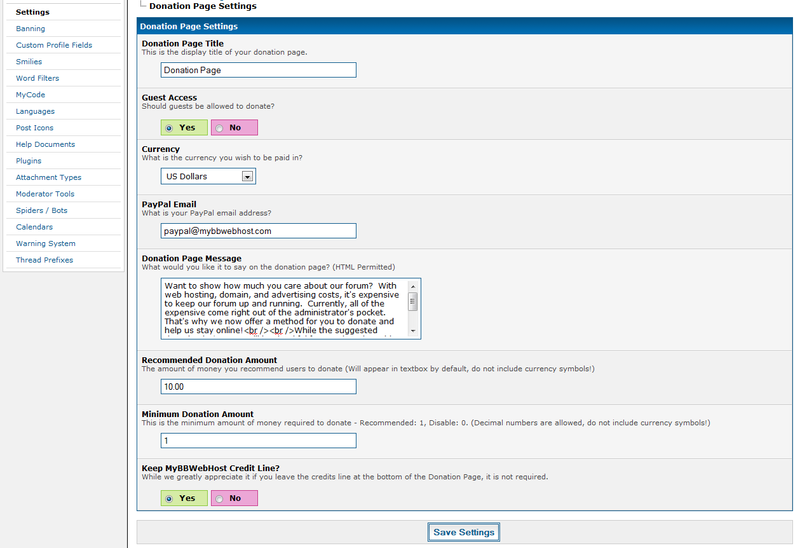 3) Go to Configuration --> Donation Page Settings and edit the settings and message as you wish. 4) You can find the donation_page template in Global templates. Has this plugin helped you out? I appreciate any and all donations, big and small. Accept Online/Offline Donations through Payza, 2checkout, PayPal, Western Union and Bank/Wire transfer.